Warm-Up System | Go to Sleep. Study. Mathinate. 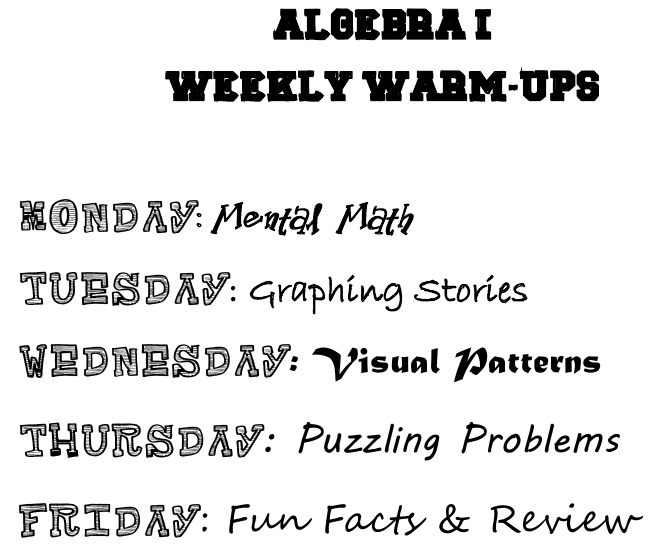 For the past few years, I’ve relied on Daily Math Practice, Grades 6+ for the Math 7 warm-ups and it has worked well for both the 6th and 7th graders. I would make copies for each 9 weeks and put them in folders with fasteners for each student. This worked pretty well, as the students learned to get their folder first thing and work on the warm-up for the first 3 or so minutes of class (as soon as the bell rings, I hit the timer on the SmartBoard). In algebra I, I would just come up with some review questions to post on the board and the students would write their answers on lined paper in their folders. The first year I did all that, I tried to grade the folders every week, which was tedious. I’ve stopped grading warm-ups, but the students still do them. This year, since I’m teaching pre-algebra, I don’t want to use the Daily Math Practice because it’s too elementary. So, I went about searching for a new system. There aren’t any good warm-up books for either pre-algebra or algebra I, as far as I can tell. But, I came across Fawn Nguyen’s post, which inspired me to work on something for pre-algebra, and then when I read Matt Vaudrey’s tweet, I decided to keep going for a real system for algebra I. So, pre-algebra’s warm-up schedule is borrowed heavily from Fawn. Monday uses patterns from What’s Next. Tuesday (choosing 3 of the 5 problems) and Wednesday use the Grade 8 Week by Week Essentials provided by North Carolina. On Thursday, I decided to use questions from the Would You Rather? blog. Finally, Fridays will be the Fun Facts, available on Fawn’s blog, and review questions related to that day’s quiz. I plan on printing everything out and assembling it in order beforehand, to put in the folders. So, to keep the students organized, I’ve made a template for Thursday’s and Friday’s responses. 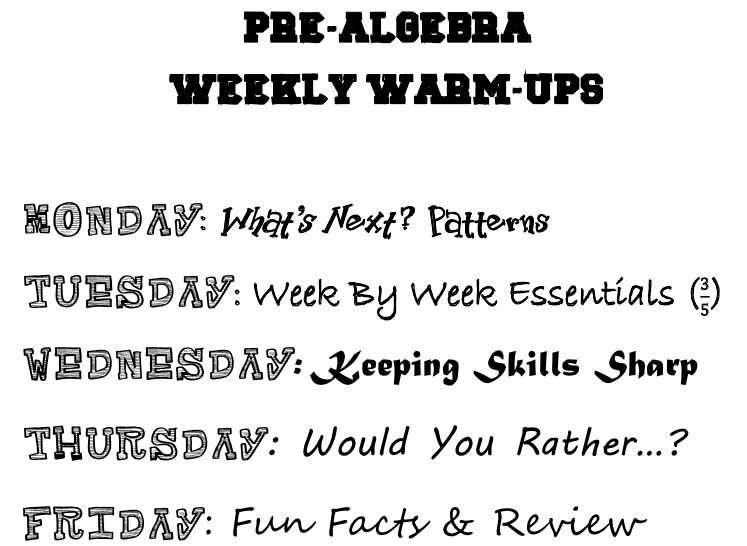 For algebra I’s schedule, I wanted to increase the rigor a bit and also have it be different enough from pre-algebra that students that have me twice won’t be bored. On Monday, students will be given 5 mental math problems; I’m using the ones from AEA 267. On Tuesday, I’m going to show one video from Graphing Stories for the students to practice graphing. On Wednesday, the students will complete the form from Visual Patterns on one pattern. On Thursday, students will answer the algebraic sense problem from this daily problem solving doc and will complete a KenKen puzzle (starting the year with 3 x 3). Finally, on Friday, it’ll be Fun Facts & Review, just like in pre-algebra. I also made a template for the algebra I warm-up, which includes writing space for all 5 days. I’m feeling really great about having figured the warm-ups out for both classes. This is my last day “off” before going back to work tomorrow (meetings all day! ), but I’m riding this wave of productivity as long as I can. Pingback: Classroom 2013 | Go to Sleep. Study. Mathinate. Pingback: MTBoS Mission #3 | Go to Sleep. Study. Mathinate. Pingback: Warm-Up System: Again | Go to Sleep. Study. Mathinate. Pingback: Algebra II Warm-Up Template | Go to Sleep. Study. Mathinate.